Professional? Yes. Meticulous? Absolutely. But inspiring? Well, no. 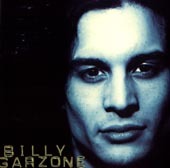 Billy Garzone is a Boston-based guitarist / songwriter whose new release challenges the notion that all musicians are artists, being far more the former than the latter. While there's nothing blatantly wrong with any of these songs, they just can't cut the mustard when it comes to putting chills down your spine. it's extremely safe-sounding organic rock with a vaguely Christian message, taking few if any risks; the pop equivalent of a money market fund. Mr. Garzone sounds thoroughly bored - one can only hope for his sake that he isn't altogether happy with the way his music is turning out. Tentative hints at funk, bossa nova, folk and pop all end up being watered down by the same vacuous arrangements. Titles like "Too Many Times," "Feeling Blue," "Good Times" and "Melody" say it all - there's just not enough originality here. "Mother Nature's Law" tells us that maybe, just maybe, we should save the earth. "Love Will Keep You From Hell" tells us that maybe, just maybe we all ought to be nice to each other. "Good times, good times / lookin' for those good times." Geepers creepers, Billy, don't you think it's time you stretched a few boundaries here? It could be said, theoretically, that this isn't supposed to be a meaningful album (no argument here), and as Billy says it should just fill the function of providing well, good times. But good times require enjoyment, and the only emotion implicit in this album is utter ennui.